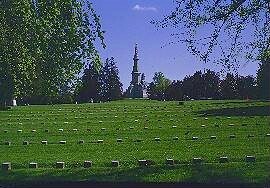 One of the first truly "national" cemeteries, the Soldiers National Cemetery is located adjacent to Evergreen Cemetery on the southern edge of Gettysburg. The dedication of the burial ground was the setting for President Abraham Lincoln's most well known and revered speech, the Gettysburg Address, which he delivered on November 19, 1863. The site of the cemetery was chosen for its scenic view of the South Mountains west of Gettysburg and because of its importance as a key position in the Union line during the battle. Monuments, markers, and cannon to Union regiments and batteries located throughout the cemetery remind visitors that the cemetery is also part of the battlefield. A total of 3,512 bodies of Union soldiers were interred in the cemetery grounds after the battle, of which 979 are unknown as to name or unit. The Soldiers National Cemetery was transferred to Federal authority soon after it was completed and was administered by the United States War Department until 1933, when it was transferred to the National Park Service. Today the cemetery and cemetery annex have 6,000+ burials from all of America's wars. As the armies moved away from Gettysburg, the residents of Adams County were shocked to find what had been left behind- thousands of graves scattered in farmyards, fields, and gardens surrounding Gettysburg. Approximately 6,000 Union and Confederate dead were buried on or near the battlefield. Mortally wounded men died in field hospitals daily, adding more and more to temporary cemeteries laid out near farm buildings and homes where they had breathed their last. Many of the burials, especially those on the battlefield, had been done with haste. Heavy rains throughout July washed away the loose soil, exposing the decaying bodies. Remnants of a hand, foot, or head sticking out of the ground became a common sight and the accompanying odor hung like a pall over the land. Never before had the population of Adams County been so affected by the war and experienced so much death and suffering. The terrible condition of field burials inspired a Gettysburg resident named David McConaughy to take action. The Gettysburg lawyer and newspaper editor passionately argued that the defenders of the Union cause should have an honorable, proper burial and not poorly marked shallow graves scattered in farm fields and woods. There should be a cemetery where the Northern dead could rest in peace, their graves preserved in honor of their sacrifice. David Wills, another Gettysburg attorney, believed the Union cemetery project a worthwhile cause and though he spoke with McConaughy about the plan, different philosophies on cemetery design, location, and funding fueled a conflict between the two. 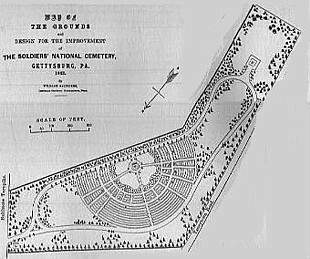 For a brief time it appeared that any cemetery project was doomed to failure, but the commonwealth of Pennsylvania became involved and Wills became the primary agent for the new cemetery at Gettysburg. A frustrated McConaughy dropped his cemetery proposal, but refused to abandon his idea of preserving a portion of the battlefield as a memorial to the Union dead and the army in which they served. Within a year, he had established the first organization to preserve a portion of the battlefield landscape that eventually became Gettysburg National Military Park. Using his political connections to visit Pennsylvania Governor Andrew Curtin, David Wills presented his plan for a formal cemetery to be established on the battlefield. Curtin was highly impressed with the project and Wills' sincerity. The governor had visited Gettysburg soon after the battle and was among the many who were disturbed by the terrible conditions there, thousands of wounded men being cared for in churches, private homes, and farm buildings. The sight of human remains sticking our of shallow graves sickened the governor who returned to Harrisburg to ponder what could be done for the people of Adams County and how to tackle this huge problem of the county as a mass graveyard. Curtin pledged his complete support to Wills' proposal with an appropriation of state funds to begin land purchases and the process of re-burial in the new cemetery. Thus, the Soldiers National Cemetery came to being. Landscape architect William Saunders was hired to design the cemetery, located on land purchased on the western side of Cemetery Hill. Wills worked tirelessly with Saunders and agents sent from Pennsylvania, New York, and other northern states who were to investigate the cemetery project and report on the proper disposition of their deceased. Soon after the site had been laid out and burials began, Wills organized a dedication ceremony initially planned for October of that year. Invitations were sent to noted dignitaries and musical groups, and Mr. Edward Everett, a dedicated Unionist and orator, who would be the featured speaker. Everett suggested the date of the ceremony be pushed back one month so that he would have time to arrange his speech for this important occasion and Wills made the arrangements. Almost as an afterthought, an invitation was sent to President Abraham Lincoln to attend the ceremony and perhaps provide "a few appropriate remarks." Somewhat to the surprise of Wills and his associates, the president agreed to attend. The National Cemetery Dedication was held on November 19, 1863. The National Cemetery, ca. 1910. The Soldiers' National Cemetery was finally completed in 1869 after the installation of grave markers, a stone-chipped walk, and the Soldiers National Monument, which stands in the center of the cemetery. Though the Union dead had been taken care of, the Confederate dead still remained in scattered field burials and hospital sites, including the temporary cemetery where Camp Letterman had been. Concerned with providing their native sons with a proper burial, ladies' memorial societies in several southern states secured state monies and donations to have the Southern dead relocated to their home states. (Left) The Soldiers National Cemetery in 1910. The first re-internment of Confederate dead began in 1872, once again performed by Samuel Weaver who had been in charge of the re-internments in the Gettysburg national cemetery. Carefully boxed and labeled, the remains were shipped by rail to cemeteries in Savannah, Charleston, and Raleigh. The remaining bodies were to be shipped to Hollywood Cemetery in Richmond, Virginia, where a special section was set aside specifically for this purpose. The boxes of remains, some containing as many as five in each, were set side by side in the designated plot as they arrived. The last of these reburials was completed by 1877. Today the Soldiers National Cemetery is one of the most honored and visited sites in Gettysburg National Military Park. 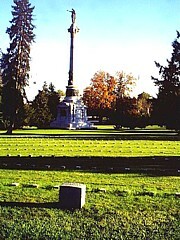 In the center of the cemetery stands the Soldiers National Monument, erected in 1869 as a national memorial of sorrow. Marble statues around the base of the monument, carved by the famous sculptor Randolph Rogers, represent four chapters of time- history, war, peace and plenty. Atop the monument is the figure of Liberty who holds a sword in one hand and the wreath of peace in the other, representing the constant struggle for freedom. Also in the National Cemetery is the New York State Monument (at left), placed here because of that state's sacrifice during the campaign. More New York soldiers died or were injured at Gettysburg than from any other Union state. This towering monument, one of the tallest in the park, stands in the northern end of the cemetery and is adorned with bronze reliefs that depict certain events of the battle. The symbols for each of the army corps in the Army of the Potomac also adorn the monument, which was dedicated on July 2, 1893, with a grand ceremony that included many veterans of the battle, including former general Daniel Sickles. Also in the cemetery are monuments and markers to several Union infantry regiments and artillery units that were stationed here during the battle, the silent guns now overlooking the serene cemetery grounds. 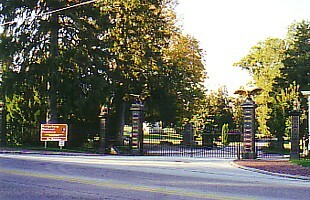 The cemetery entrance on Baltimore Street. Visitors to the cemetery will find two other unique monuments including the Lincoln Speech Memorial, which memorializes the Gettysburg Address. Dedicated in January 1912 to commemorate President Abraham Lincoln's famous speech, the memorial bears a striking likeness of the president sculpted by Henry K. Bush-Brown, who also sculpted three equestrian monuments. Just inside the north gate of the cemetery is the bronze statue to Major General John F. Reynolds who was killed at Gettysburg. General Reynolds is remembered at Gettysburg with three monuments dedicated to his memory- this statue in the cemetery, a marker on the location where he was killed on July 1, 1863, and an equestrian statue on Rt. 30 West of Gettysburg. Also in the cemetery is a monument to the 1st Minnesota Infantry, placed within the Minnesota plot. 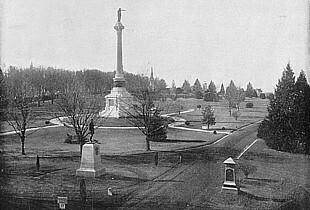 It is one of the earliest monuments erected at Gettysburg, placed here before the cemetery was formally completed in 1869. Among the honored burials is Captain William A. Miller of the 3rd Pennsylvania Cavalry. 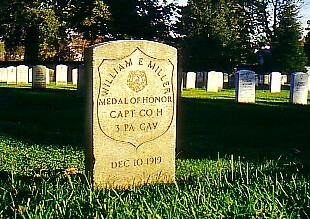 Captain Miller, who died in 1919, received the Congressional Medal of Honor for gallantry in action at the Battle of Gettysburg. He is interred in one the outer lying sections of the National Cemetery. Interred in the Ohio section is Private George Nixon, Company B, 73rd Ohio Infantry, the great-grandfather of former president Richard M. Nixon. Mr. Nixon paid a visit to his ancestor's grave while he was vice president during the 1950s. Also buried in the cemetery is Colonel Charles Collis, the former commander of the 114th Pennsylvania Infantry, also known as "Collis' Zouaves". Though Colonel Collis was not with his regiment at Gettysburg, be became enamored with the battlefield and enjoyed the area so much that he built a summer home here, which he called "Red Patch". The house still stands on West Confederate Avenue. Remarkably, burial in the cemetery of Gettysburg dead has continued up until the 1990s. Among its many relics, the Rosensteel Collection of Civil War artifacts included human remains found on the battlefield and at field hospital sites long after the end of the war. These were gathered and buried in a single grave in the cemetery in 1991, followed in 1995 by the burial of a soldier's skeleton recovered from the first day's battlefield. A special detail from the 3rd United States Infantry acted as honor guard at both events. The Soldiers' National Cemetery was designed by William Saunders, a noted landscape architect and gardener, employed with the US Department of Agriculture in Philadelphia. Saunders' designs for city parks and recreational grounds, such as Hunting Park in Philadelphia, brought him acclaim. In the weeks after the battle, he was asked to assist attorney David Wills in planning the new cemetery at Gettysburg, which would be a challenge as every Northern state that lost native sons at Gettysburg had assigned state agents and commissions to oversee the burials and cemetery design. "I was pleased with the site," Saunders wrote. "On my first visit I studied the ground thoroughly and thought of various methods of treatment. It occurred to me... and I felt it all important under the plan that the remains of the soldiers from each State should be laid together in a group. In fact, I had examined the ground before suggesting an addition to it and had employed an evening considering how best to arrange for interments." Saunders' simple design arranged burial plots, each distinguished by the state from which the men served, in a semi-circular pattern around a central point. It was here that a symbolic monument would be erected, the "Soldiers' National Monument" that would signify the backgrounds, service, sacrifice, and place in time of the fallen. The headstones were designed to be curved granite markers inscribed with the names and regiments of the dead, placing no special distinction between officers and enlisted men except for a note of their rank. The movement of bodies to the cemetery began in the fall of 1863. As the burials progressed, Saunders took special interest in the final layout of the plots before returning to his office in Philadelphia. The burials were completed in 1864 and landscape work began in earnest with walkways and an avenue constructed and grass seeded over the grounds. After the war, Saunders landscaped the grounds of the Lincoln Tomb at Springfield, Illinois, and founded the National Grange in 1867. Another of his more notable landscape designs was the campus of Illinois State University in Normal, Illinois. The cemetery at Gettysburg remains one of his greatest works. See also Pennsylvania Civil War History.